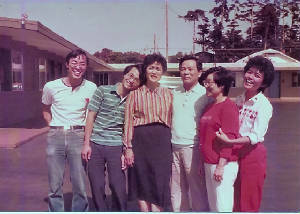 In 1982, William and Kay Lin decided to leave their home in Taiwan to come to the United States, the land of opportunity and freedom. Accompanied by three of their children, Ta, Scott, and Sui, they settled on a small town on the central coast of California, far from other Chinese families but an ideal place to raise a family. There they came across a commercial property on Main Street, just two blocks from the embarcadero. On July 1, 1983, the Lin family bought the Sundown Motel in Morro Bay, California. William, Kay, and their two sons and daughter persevered through many hardships as immigrants. The beginnings were humble with siblings, parents, and children all living within one small manager’s quarters within the motel. The business grew steadily, yet continued to be 100% family-run, with each family member pitching in to maintain a standard of excellence in hospitality even through economic fluctuations. As the business matured, Scott and Sui moved away to pursue their ambitions, leaving the eldest son, Ta, and his wife, Ann, to take over the business. Ta and Ann knew that leading the family business would provide for the future of their growing family as well as support their retiring parents as is customary for most Chinese families. Today, the business operates with hundreds of regular visiting guests a year, well-rated reviews on travel sites, and upgrades to every room on a regular basis. The Lin family built a basic motor hotel into a family-run inn that caters to modern needs with wifi and flat-screen TVs, while maintaining nostalgic touches like “Magic Fingers Massaging Beds” and themed rooms. In 2013, Ta and Ann celebrated their thirtieth year as proprietors of the Sundown Inn. Their son and daughter are grown, and the extended family has moved back to Taiwan, but Ta and Ann still personally welcome all their guests—from regulars who have become old friends to first-time visitors to Morro Bay. They look forward to hosting you on your next visit. Be sure to ask them for a story from their thirty years of managing a small business in Morro Bay, California!